Washington was an avid dog fan and kept packs of them on his plantation. He loved these animals and had nearly every Kennel Club breed at one time or another. He chose some very strange names for them too, such as Sweetlips and Madame Moose – can you imagine our president yelling those names? It did cause a little trouble with Mrs. Washington, when one of his most prized hunting hounds stole their dinner ham. The French hound named Vulcan stole the dish from the kitchen and quickly took off with the goods. Some presidents have so many middle and extra names that they are the bane of every school child. 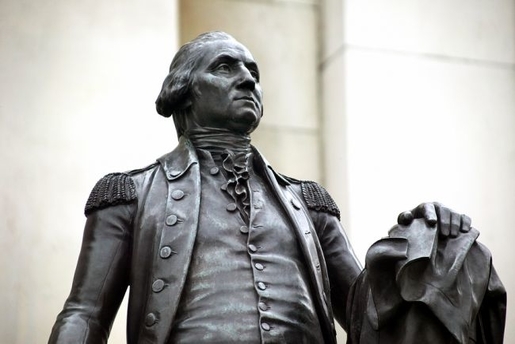 George Washington was never given a middle name and has one of the shorter titles to remember. He’s also the easiest to remember when it comes to chronological order too! Washington DC is a city filled with nightlife, something that this president would have hugely enjoyed. According to reports, he once danced at a social occasion for three hours straight! Washington loved to dance and his own social affairs were well known to last for many hours. His guests would write about his parties for months after the occasion. One of the most famous stories about this president was the Cherry Tree tale. In this, Washington is said to have chopped down his father’s cherry tree and when asked about it he was honest. This was the beginning of the myth that he could not tell a lie but it is actually purely fiction. It was created by a biographer after his death to sensationalize his early life. Any school child will tell you that George Washington had wooden teeth, and this is another bizarre myth about his life. He wore dentures that had been cast from lead and gold during his life but most commonly used ivory. As you would imagine, eating and drinking quickly stained these teeth and this may have been why people imagined they were made of wood. It’s worth pointing out that the pain in his teeth is the only historical imperfection in the man, as everything else written about him is in reference to his strength, intelligence and furore. Elements of Washington’s life have been taken to near superhero proportions, though his teeth still serve to show his humanity. Not content with being a famous person while he was alive, George Washington also makes a number of spooky appearances. Hundreds of people have reported seeing his ghost at various points throughout history. Those who have stayed at Mount Vernon often write later about their experience with the spectre. If you visit this historic site with us then you might just see him yourself!